"I break the Old Nihonga, You sould follow me and build New Nihonga" he said to younger artists in his same school. 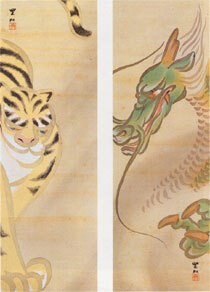 He was a Pioneer of Modern Nihonga, but died young age 35, so his artworks are not many. Ivy Lane. Scene from "The Tales of Ise"